(London/New York: Cambridge University Press, 1999). This study of late 20th-century U.S. fiction is one of 25 book-length contributions that constitute the new Cambridge History of American Literature (ed. Sacvan Bercovitch). 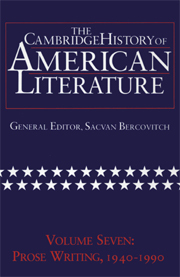 The Journal of American Studies has declared it “without doubt and without any serious rival, the scholarly history for our generation.” Postmodern Fictions explores the genres of the novel as laid out in 1960s criticism: the experimentalism of Pynchon, Barth, and Hawkes; the “traditional” fiction of Mailer, Roth, and Vonnegut; the “women’s writing” of Morrison, Robinson, and Walker. Steiner’s conclusion is that what looked like separate trends in 1960 or 1970 had become so overlapping and interconnected in works of the 1980s that the map of American fiction needed to be totally redrawn.